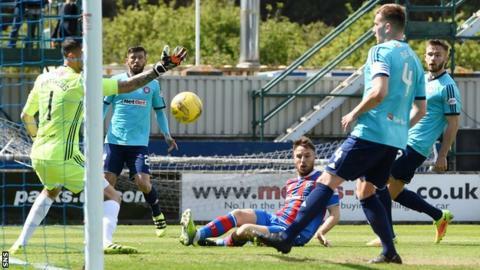 Premiership bottom side Inverness Caledonian Thistle moved to within four points of opponents Hamilton Academical with three games to play. Brad McKay crouched to volley in Greg Tansey's deep free-kick early in the match. And Tansey converted a penalty after Massimo Donati had fouled Ross Draper. Accies were upset Ali Crawford was not awarded a second-half spot-kick for a challenge by goalkeeper Ryan Esson but netted late on through Danny Redmond. The gap between Caley Thistle and Motherwell also stands at four points, with Well behind Hamilton on goal difference after losing to Ross County. The first-half performance was exactly what Inverness manager Richie Foran has been searching for and came with their backs planted firmly against the wall. They were terrific. Adversity sometimes brings out the best in people, although nerves did seem to take effect after half-time. Foran has said for some time his side just needed one win to get going. They have it and look capable of more as the pressure turns, at least temporarily, to sides above. Tansey, who has agreed a pre-contract to join Aberdeen, was at the heart of the Saturday lunchtime victory. It was his delivery that found McKay ghosting in and the defender's finish was perfect. Another Tansey delivery was rewarded when Donati wrestled Draper to the ground. Tansey took the responsibility and delivered under pressure. In truth, Inverness could have been out of sight by the break. Billy Mckay should have done better from close range twice and Alex Fisher somehow screwed a header wide from a few yards after Remi Matthews had parried Tansey's drive. And, in the second period, Scott Boden could have sealed the win when clean through but dinked over. Martin Canning's side improved significantly after the break as Crawford and Redmond were sent on in place of Donati and Rakish Bingham. And Crawford thought he had earned a lifeline. As Gary Warren tried to shepherd the ball out, Esson came flying out and inexplicably took the substitute down. Referee Andrew Dallas did not point to the spot, leaving Hamilton players in disbelief. It was a huge escape for the home side. Having offered little earlier in the match, other than a great chance for Darian MacKinnon which he prodded wide, the second-half response was firm. Dougie Imrie, Crawford and Greg Docherty all came close but ultimately they did not threaten enough and gave themselves too much to do after leaving themselves repeatedly exposed in defence. Redmond's late finish was little consolation, although the goal may yet have an important part to play in the final make-up of goal difference with so few points separating the sides. Match ends, Inverness CT 2, Hamilton Academical 1. Second Half ends, Inverness CT 2, Hamilton Academical 1. Goal! Inverness CT 2, Hamilton Academical 1. Daniel Redmond (Hamilton Academical) left footed shot from the centre of the box to the bottom left corner. Assisted by Dougie Imrie. Substitution, Inverness CT. Billy King replaces Jake Mulraney. Corner, Hamilton Academical. Conceded by Kevin McNaughton. Substitution, Inverness CT. Kevin McNaughton replaces Brad McKay. Attempt saved. Scott McMann (Hamilton Academical) right footed shot from outside the box is saved in the bottom left corner. Jake Mulraney (Inverness CT) wins a free kick on the right wing. Foul by Greg Tansey (Inverness CT). Giannis Skondras (Hamilton Academical) wins a free kick on the left wing. Attempt blocked. Henri Anier (Inverness CT) right footed shot from the centre of the box is blocked. Substitution, Hamilton Academical. Eamonn Brophy replaces Greg Docherty. Attempt missed. Scott Boden (Inverness CT) right footed shot from the centre of the box is just a bit too high. Attempt missed. Greg Docherty (Hamilton Academical) left footed shot from outside the box is too high. Hand ball by Billy McKay (Inverness CT). Scott Boden (Inverness CT) is shown the yellow card for a bad foul. Foul by Scott Boden (Inverness CT). Greg Docherty (Hamilton Academical) wins a free kick in the attacking half. Attempt missed. Henri Anier (Inverness CT) left footed shot from outside the box is close, but misses to the left. Attempt saved. Ali Crawford (Hamilton Academical) right footed shot from outside the box is saved in the centre of the goal. Dougie Imrie (Hamilton Academical) wins a free kick in the defensive half. Corner, Inverness CT. Conceded by Alejandro D'Acol. Corner, Inverness CT. Conceded by Scott McMann. Scott Boden (Inverness CT) wins a free kick in the attacking half. Foul by Georgios Sarris (Hamilton Academical). Substitution, Inverness CT. Scott Boden replaces Alex Fisher. Corner, Hamilton Academical. Conceded by Brad McKay. Foul by Ali Crawford (Hamilton Academical). Delay in match Billy McKay (Inverness CT) because of an injury.